The government’s move to overhaul revenue collection and introduce tax reforms by enacting the new Inland Revenue bill without creating awareness has prompted tax officers to take to the streets, Inland Revenue Department (IRD) trade unions said. The IRD joint trade union committee demanded the government to withdraw the new IR Bill which is devised without the consultation of the IRD officials or else threatened to resort to strong trade union action against it. The committee noted that the new Bill paves the way for an economic crisis paralysing the revenue collections of the department which has a history of over 85 years. 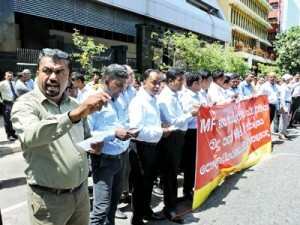 IRD employees staged a protest demonstration opposite their headquarters in Colombo on Monday expressing their protest against the government’s action to introduce an Income Tax Bill or IR Bill without creating awareness among any parties coming under the purview of the new Bill. The new Bill has given unprecedented powers going beyond the existing statutes to the Finance Minister, Joint Secretary of the IR Services Union H.A.L.Udayasiri told the Business Times adding that the minister has powers to inspect tax files of individuals and appoint teams of tax officers without considering the service minutes of the department. According to the tax administration section of the Bill, tax officers may no longer be required to give reasons for rejecting assessments, and the Finance Minister may increase income tax rates without parliamentary approval, he said. He noted that there was a hidden agenda in the bill to separate the implementation of statutes and tax administrative functions of the department. This will affect the promotional prospects, job security and benefits of employees, a member of the joint committee said adding that they have written to the President, Prime Minister and Finance Minister to withdraw the proposed amendment to the IRD Act and protect the rights of employees. They also emphasised the need of carrying out tax administration and revenue management in accordance with the present constitution and regulation requirements. The independent tax administration would be politicised after the enactment of this Bill, he said noting that taxpayers will be burdened with new taxes and the government will lose, not gain, revenue by the time officers familiarise themselves with the new law and procedures. However a senior Treasury official told Business Times that the new law is expected to double the income tax-to-GDP ratio to 4 per cent by 2020 from current 2 per cent. Responding to allegations on the failure to create awareness on the Bill among relevant parties, he said the Finance Ministry didn’t invite public consultations for the drafting stage of the Bill. Bills become public documents once tabled in parliament, he pointed out adding that a 14-day period will be given for anyone to file objections in court before it’s taken up for voting. He disclosed that the ministry provided the draft bill unofficially to several businesses and tax consultant firms. The implementation of the new law will take place in stages over 18 months, IMF sources revealed. The IMF is preparing clear guidelines for officers and taxpayers, defining the provisions of the Bill, these sources said. IMF officials expressed the need of tax reforms so as to have a more predictable, efficient and equitable structure and in generating the needed financial resources in support of the country’s ambitious social and development objectives. Sri Lanka’s new income tax bill that will replace the existing law with a more efficient, modern and broad-based tax framework will contribute to increasing Sri Lanka’s very low level of government revenues, a key constraint on the sovereign credit profile, Moody’s Investor Service has said in a report. Last week’s gazetting of the proposed tax reforms also paves the way for the International Monetary Fund (IMF) to approve a pending third loan tranche from Sri Lanka’s three-year, US$1.5 billion Extended Fund Facility (EFF) programme. Moody’s said the continuity of the IMF programme will support the authorities’ ongoing fiscal and structural reform efforts while the disbursement of the $168 million loan installment will boost Sri Lanka’s external liquidity position. The Bill will, among other things, simplify the sources of income, introduce a three-tier tax structure with reduced exemptions and reintroduce the capital gains tax. The act also proposes: modernising rules related to cross-border transactions to address base erosion and tax avoidance, broadening the tax base by removing excess tax incentives and expanding income tax sources. “Sri Lanka’s current Inland Revenue Act is a complicated tax scheme that hinders the transparency of taxes for potential investors in fixed and financial assets, limits the effectiveness of local tax officials’ supervision efforts, and contributes to a very low taxto-GDP ratio. In particular, the current Act does not efficiently deal with modern business structures and commercial transactions, including cross-border transactions, Moody’s said. Moody’s says the bill will face limited opposition in Parliament when it is presented. The implementation of revenue reforms that foster long-term fiscal consolidation will be critical to shoring up Sri Lanka’s credit profile. The country’s large debt burden and weak debt affordability weigh significantly on its creditworthiness. The government’s debt burden of 79.3 per cent of GDP in 2016 was higher than the median of 53 per cent for B-rated sovereigns). The debt burden has risen from a low of 68.7 per cent of GDP in 2012. With nominal GDP growth forecast to be slower in coming years than over the past decade, persistent and sizeable fiscal deficits would further increase Sri Lanka’s debt stock, Moody’s said. Sri Lanka’s low income tax efficiency and tax collection provide significant scope for revenue reforms that target broadening of the tax base and increasing the tax revenue-to-GDP ratio, which was only 12.4 per cent in 2016. Total government revenues (combined tax and non-tax) are also very low. “Implementation of the value-added tax (VAT) rate hike in late 2016 will contribute to higher revenue generation in 2017. Moving forward, if the government’s revenue reforms, including the new Inland Revenue Act, are implemented successfully, we expect general government revenues to increase to about 14.7 per cent of GDP in 2017 and 15.0 per cent by 2018. The IMF projects revenues to rise further to about 16 per cent of GDP by 2021,” the agency said.